What turned out to be Oscar’s final pro fight, in 2008, brought the curtain down on a fantastic career in devastating fashion. Demoralised and roundly beaten up, De La Hoya retired on his stool unable to cope with the speed and power of his flighty southpaw opponent. Manny’s left hands were landing time and again and the masterclass turned into a beating in the seventh as the ‘Golden Boy’ shipped powerful flurries on the ropes, completely paralysed against throwing back. Concerns that De La Hoya would not be able to boil his frame down to the weight were met by Oscar arriving a few pounds under, but unfortunately sacrificing speed and sustainability with the dramatic weight cut – he looked a shadow of his former self and almost corpse-like on the scales. Pacquiao showed no mercy and walked away with a cool $11million in his pocket and the realisation that he had truly reached superstar status. Hatton was training with Floyd Mayweather Snr in an ill-fitting relationship, after Ricky had split with Billy Graham. Out of sorts going in to the bout, Pacquaio made sure Hatton was not going to settle in to this one either and his speed with both the straight left and right hook were devastating weapons for any version of Hatton to deal with. Pacquiao made it six world titles in six weight divisions (albeit the light-regarded IBO in this instance). 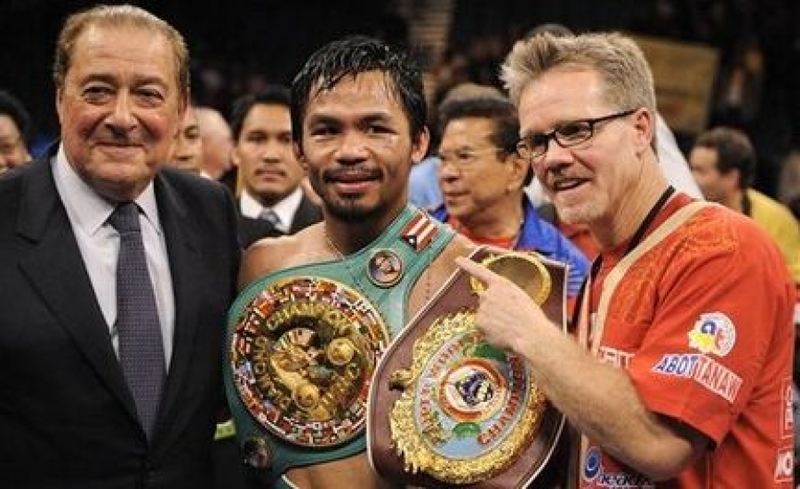 This was truly the golden era of Pacquiao’s career and talk was high of a fight between him and Floyd Mayweather. Both were at their pinnacle and it is a shame it never came off at this point in time. When compiling this list I toiled over whether to include the Erik Morales rematch (where Pacquiao emphatically avenged a points loss with a six-round KO) or even the statement he made when forcing Marco Antonio Barrera’s corner team to retire him at the end of round 11. Instead I’ve included this lesser known fight because it was the point when Manny introduced himself to the American audience, in 2001, and I can recall watching it at the time. South African Ledwaba was making the sixth defence of his IBF super-bantamweight title but was no match for the fresh and hungry raider from the Philippines. Pacquiao in fact had only taken the fight on short notice, stepping in for Mexico’s Enrique Sanchez who pulled out just two weeks before his shot. The decision was a monumental one for Manny who presented himself to the HBO audience and MGM crowd on a big De La Hoya undercard. Knocking down Ledwaba three times, he finished him off in the sixth. Pacquiao picked up $40,000 for his efforts but as manager at the time Murad Muhammad grinned from ear to ear in the background after the fight, his charge had gained priceless exposure in his quest to conquer the States. The IBF and WBA belts were on the line in 2004 when Manny made his first title step-up at featherweight, against Mexican counter puncher Marquez. Pacquiao’s speed and accuracy seemed too much for Marquez in the opening round and Juan Manuel was dropped three times and on the verge of being stopped. Remarkably the Mexican regrouped and boxed his way back into a thrilling contest and was doing the better work down the stretch. Two judges had it either way but Burt Clements’ 113-113 card was controversial in that he scored the opening round incorrectly and later admitted so, but the commission refused to alter his final total which would’ve read 113-112 to Pacquiao. The pair would share the ring a further three times. Pacquiao won a split in 2008 and a majority in 2011, with Marquez disputing the decision in both. Fan reaction suggested that he may have had grounds for complaint. In December 2012 Marquez finally gained his perceived justice with a stunning one-punch knockout. A fifth fight was often mooted but never came to fruition. Cotto’s WBO welterweight crown was on the line as the pair locked horns in Las Vegas. Once again Pacquiao’s speed was to much for an opponent and Cotto was dropped in the third round from a right hand and a thudding left reintroduced the Puerto Rican to the canvas in the fourth. Cotto continued trying hard but he was bruised, bloodied and battered when referee Kenny Bayless said no more in the 12th round as Miguel took a shellacking on the ropes.